It is quite obvious that the recidivism of an administration that consistently lies and deceive the people is once again in motion. A red carrot is being dangled before the people of the Grand Fond constituency in the hope that the people will forget all about their pain and suffering. A few weeks ago the Prime Minister in his bullheaded attitude decided that he wants to use the World Bank small business development funding to impress the people of the East and the Grand Fond area in particular with the promise to repair the dilapidated roads. Note well that these roads have been in need of repair for a number years before Hurricane Maria. The road repair plot seem to have hit a snag and now the Prime Minister in his desperation decided that the people of Grand must at least see some earth moving activities going on in the Grand Fond constituency and so he hastily dispatched an excavator right next to the Grand Fond playing field to supposedly begin the construction of an apartment building for residents of the grand Fond area. 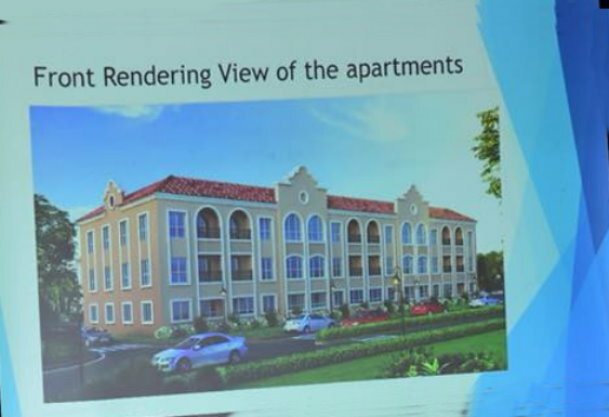 The apartment building conceptual rendering was unveiled on March 26 of this year. One has to wonder what kind of due diligence was given to engineering, environmental and residential considerations for the project development. An apartment development that the government promised would put those apartments in London and New York City in the shade. 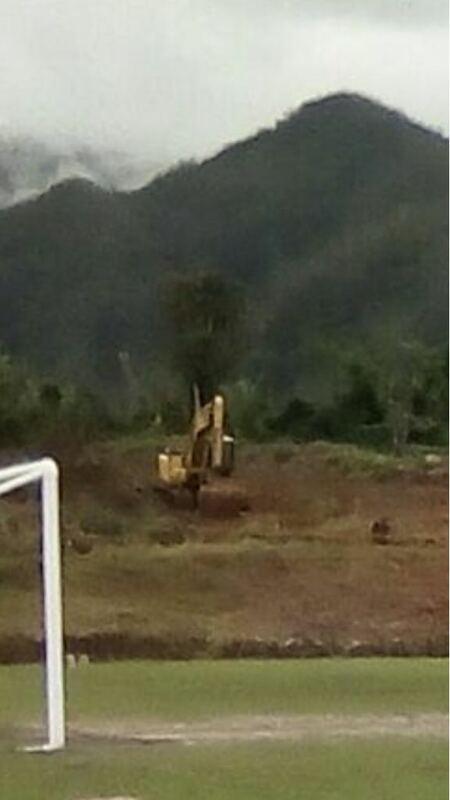 The desultory ground breaking and earth moving activities a few feet from the Grand Fond football field may be another one of the Skerrit government’s attempt to bamboozle the voters of the Grand Fond constituency. Whether or not an apartment building is a worthwhile solution for the Grand Fond constituency it must be noted that 7 months after the Hurricane Maria some critical government entities are yet to be given the much needed urgent attention and many people are still living in make shift shelters or even tents around the island. In some areas government workers still have to resort to relieving their bowels in the back of the ravaged government office building, Police Stations are still uncovered while the government is playing squirrel with building materials that were either received or purchased on the behalf of the people of Dominica. How then do we rationalize the suspicious and cursory ground breaking activities near the Grand Fond playing field? Is it just the usual DLP chicanery politics and the heartless behavior of a dictator? It is no secret that the current DLP parliamentary representative for the Grand Fond constituency Mr. Ivor Stephenson has been seriously ill for the past two years and because of the nature of his ailment a bi-election may be imminent. The murmur is that the dispatching of the excavator to the Grand Fond location was a nervous and desperate reaction to Senator Dr. Fontaine’s presence in the constituency over last three weeks. Dr. Fontaine who is now contracted as a senior economic and international policy advisor with the government of South Sudan regularly returns to Dominica after every two months spent in the country of South Sudan. The DLP administration is fully aware that like a number of other constituencies, the Grand Fond constituency is only winnable by pervasive corruption, a dysfunctional electoral system stacked with forgery and the imposition of overseas based illegal voters. It is our hope that with the country burdened by 15 years of growing poverty and the worsening effect of the Hurricane Maria disaster, the Roosevelt Skerrit government ought to have some apprehensions about their brigand like and ruthless conduct during any kind of election. This government should not be allowed to use the country’s resources to economically enslave the people with widespread vote buying schemes. We must all insure that the eyes of the world remain on Dominica. Poverty is the natural outcome of bad governance and despotism. The natural tendency of a repressive regime is to provide monuments or the promise thereof as a consolation to the indigence that they have crafted and maintained. The hope is that people would forget all about their pain and suffering as long as the empty red promises and monuments and even white elephants continue to dangle before the people. We thought it was necessary to highlight the Grand Fond deception at this particular point so that as the opposition delegates gather in Grand Fond this week end we hope that they will take the time off to visit what appears to be another act of repression and deception by a persistent con artist.